Membership of the CSG is achieved by subscribing to the Journal. We publish four issues of the journal each year. There are several options to purchase our journal. You can subscribe to the digital edition (download here), or have the print edition delivered to you. For ease of use, the subscription automatically renews but you can cancel further renewal at any time. There is also an option to collect the journal at one of our events. We also have a range of back issues for sale. If you wish to maximize your support of the CSG and reduce your carbon footprint, please subscribe to our digital journal. Our production and postage costs for the digital version are effectively zero, and all of your subscription fee is fed into our Research Support Fund initiative. Your subscription will begin with the next published edition and continue for one year (four issues). Your copy will be delivered to you by your chosen method shortly after it is published. Subscribers to the digital Journal will receive their password by email when it is available to download. 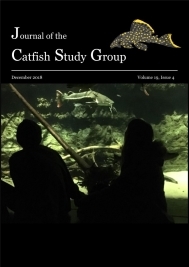 Please consider your PayPal receipt to be an acknowledgement of your order, if you see that a Journal has just been published and you have not received your copy please email secretary@catfishstudygroup.org. You may also be interested in reading some articles from past issues.